DENVER NEWSPAPER GUILD and Denver Post representatives met March 7. Management began the meeting by explaining they have received six responses to their request for proposals from outsourcing companies bidding on the inbound and outbound customer service call center work. The bid the company appears most interested in is from a call center in Honduras. Union representatives questioned management about the bids and their outsourcing proposal and requested additional information to evaluate the proposal. Based on management’s estimates, the outsourcing of call center work would save the company more than $400,000 per year. Under management’s current outsourcing proposal, they estimate two full-time and three part-time union-covered positions would remain to handle email and escalated calls. Richard Rosenblatt, the attorney who represents our union, attended the session. As he had not been at earlier bargaining sessions, management recapped their position on the issues being discussed. In reviewing their proposal, the company informed us they were pulling their proposal to move finance work to MediaNews Group, but explained the issue may come up again in the future. For the first time, they added home delivery to the list, explaining that they want to discuss costs including wages and mileage reimbursement. Management narrowed down what they are looking for regarding layoffs out of seniority order to advertising and related positions, such as sales support. Honduras, I hate it when I call customer service and cannot understand the person I am talking to. Where is the customer service in that? I usually just quit and cancel whatever I am complaining about. Lucky for you that all Colorado businesses, that are struggling, don’t feel that outsourcing, to another country, is the solution. Otherwise, there wouldn’t be anyone left to purchase your paper or frequent your advertisers. It ethically questionable to take jobs away from American citizens in a time when neither the economy nor the industry is doing well. If our media can not stand for our people then who will? Personally, I ask about the person who is helping me, what is the weather, where are you? These questions help me determine if the company I am dealing with wants my business because they share my values. I am a strong backer or buying local. If customer service is from outside the US I know what the values of the company are and I shop, spend my dollars elsewhere. I am very upset that the company I work for is willing to throw us out like tomorrows news! I haven’t been employeed as long as others but long enough to have helped this company in so many ways & this is how you show your thankfulness by giving our jobs to another country! I know this economy isn’t where it should be but what about sticking it out with us just like we stuck it out with you through all the ups & downs? DNA is going to loose alot of subscribers but do you really care? Oh yeah your going to save money other ways so Not! It’s really sad how many companies really don’t give a rats behind about anyone else but themselves! Where are the morales in all of this? Must be nice not to have to worry like us employees! Many of us are going to loose many of the things we worked/struggled for, Are YOU? Since we have been here many years we have the knowledge(knowledge is power) to help our customers in a timely & professional manner, once outsourced you are not going to have that! A good relationship already formed is hard to break! I use to talk about what a great company I worked for but now it’s leaving a bad taste in my mouth! Thanks, my family appreciates your THOUGHTFULNESS in all this process. Thanks Juanita for you comments. I feel the same as you and I hope others speak out and don’t hold back. good point:) I sure wouldn’t!! SHAME! SHAME! SHAME! Shame on you Denver Post for wanting to out source your inbound and outbound Customer Service Department to Honduras. What are you thinking? Oh that’s right it is all about the money and padding your pockets. If I have to hear one more time about how “we” (the company) have to find ways to cut our expenses I’m going to scream! How dare you sit across the table from us and say this when you refuse to cut some of the most obvious unnecessary expenditures. Please explain to me how you can justify sending by mail a thank you letter along with a high glossy ” user’s guide ” for our Digital Replica Edition? SERIOUSLY!!! Every week this company spends hundreds of dollars in costs to say thank you. This should be a no brainer! It is digital, think about it! Cut cost and save money!! Email it!!! When I heard that our company is thinking of outsourcing us, the first thing that popped in my head was the commercial of Discover where the customer service rep answers saying “Thank you for calling discover, this is Peggy how may I help you?” & the customer asks about a charge on his discover card & all that rep could say is “Yes!” without ever explaining about the charge then the rep looks puzzled & so does the customer but then the rep hangs up on the customer! Hummm sounds like that’s what kind of service our customer are going to get! You said it!! That shoud be a no brainer!! I agree with you Kathy. A ten dollar gift card for a 21.80 payment?? Have they cut their salaries to save money. We are the ones on the front line so to speak that talk to our customers each and every day. We try so hard to keep them as customers. Do they think they will get the same level of trying to save a customer?? Does the Post think that their their big advertising customers like Jake Jabs, Dealin Doug ect. would like to know that they are taking jobs out of Colorado. This is The Denver Post, the hometown newspaper. Get a grip and wake up. If I always chose the cheepest ways out…I think my house would have fallen apart by now. Same will happen with the Denver Post and Media news Group. Subscribers are not going to be happy having to deal with speaking with someone from another country. Laurie said it earlier, but who whould fee comfortable giving their credit card or personal information out over the phone with someone from a for foreign country? I sure would not! Companies that outsource are just hurting our American economy. We need to keep our jobs in the United States and keep people employed here! Sure you can save a lot of money by outsourcing, but in return you would be doing more harm than good. I am sure there a lot better ways to cut costs than by sending Customer Service to another country. Do what you must though and I believe you will be quite disappointed in the outcome. I HAVE GIVEN UP PAY,VACATION,SICK TIME,401K BENEFITS AND MORE TO HELP THIS COMPANY. ALL IN GOOD FAITH THAT WE WERE A TEAM TRYING TO SAVE OUR JOBS, MANAGEMENT INCLUDED. BUT IN THE END YOU WANT TO OUTSOURCE OUR JOBS AND HAVE NO REGARD FOR THE HARD WORK WE DO FOR YOU EVERYDAY. IT SEEMS TO ME WHILE OUR JOBS ARE SHRINKING IN NUMBERS OF PERSONAL. THE ONLY PEOPLE BEING SAVED IS MANAGEMENT.KEEP IN MIND MANAGEMENT IF YOU HAVE NO ONE TO MANAGE WERE WILL YOU BE. I am so upset that The Denver Post would even think about outsourcing. We need to keep our company The Denver Post in The USA. Not only in USA but in Colorado. It is a Colorado Company If more and more outsource this economy in Colorado will never get better. I have been a loyal customer service representative as well as many of my co workers. We did not up and leave when the merge took place nor did we when the Rocky Mountain News closed their doors. We have been right there for all of you through the thick and thin of it all. I want to see us thrive and grow!!. We are unable to if we move out. I wonder what our Congressmen would say. And how about Westword? We’re not without competitors, and this really leaves us open to ridicule. If outsourcing would save $400,000 a year, wouldn’t just cutting back on 1 or 2 managers in other departments be the same savings? At least our customers would receive the same professional customer service by keeping the department as it is. The reason outsourcing is so hard to understand, is the minute you hear how they speak with their inflections and enuciation of words is because they speak with a musical tone from a lounge show in the 60’s. I have some terrible afflictions including, but not limited to, loyalty, honesty and dependability. At one time I thought these things were good qualities to have, to carry with me and instill into my employment. Recently, I have begun to see how wrong I have been. By giving our jobs to Honduras, you are damaging the very lives of the employees, your customers and OUR COUNTRY. We all know how vital it is to keep American jobs in America. How can you do this?! How will this affect you – owner and management? Saving a few bucks… $400,000 is play money to you. It WILL NOT MAKE OR BREAK YOU! How will it affect us? Unemployement. No medical, no medication, no health. Loss of homes. Pets to shelters. IT WILL MAKE OR BREAK US!!! YOU could set a pattern for OUR USA by keeping people working. And working in the UNITED STATES! We actually CARE. Honduras doesn’t. “We Are Colorado” what a joke… Good Luck with retention and especially Stop Saves in HONDURAS!!! I think it’s a shame, that you’re outsourcing jobs so needed by the people who buy your paper. I think the paper should be boycotted by the people who bought your paper and everyone else who values their jobs. Why should the hard earned dollar …which was earned in the USA … be spent on a company who could care less about the people who buy their paper. Are the Hondurians or any other company buying your paper…NO…AND THEY NEVER WILL…. What a bad business decision…this may hurt your pocketbook more than you think it’s going to help. I will tell everyone I know…not to buy your paper. You don’t care about keeping people employed in your city…why should your city care about you! DP SHAME ON YOU. How can you take pride in creating a “LOCAL” paper with local News and ADVERTISING clients but outsource to an entirely different country the customer service support? What happened to the pride in ABC? ALWAYS BUY COLORADO? How can this company consider itself a “COLORADO” company when the people supporting you on the front line are in HONDURAS? This group HAS THANKLESSLY given up a lot to keep this department going without batting an eye. We are not game pieces. We are real people to depend on these jobs in very hard times. I’m having a really hard time believing this is being seriously considered. The impracticality of having our customers issues addressed by people who are completely unfamiliar with our city, our product and even our culture is mind boggling. It’s the truest commentary EVER that our leadership has absolutley no idea what we do here. All of this and all of us for $400,000.00? We’re only worth about $10,000.00 a piece? We don’t think much of you either. I have read all of the comments above and agree whole-heartedly. I have only been with the Denver Post for just about 2 years and have enjoyed working here very much. I am, however, shocked and solemnly disappointed that there is any consideration of outsourcing our jobs. The reasons to keep our jobs in Colorado are plentiful and begin with the Denver Post’s name and motto. We are the “Voice of the Rocky Mountain Empire”. I am positive that Honduras is nowhere near the Rocky Mountains and I am pretty sure that there are probably very, very few, if any, Denverites who will be working at the call center in Honduras (that speculation is laden with sarcasm). I am proud to be employed by and a part of one of the corner stones of Colorado, but my pride in this association is fading quickly. I think that moving our jobs down the continent would diminish the camaraderie and fellowship that so many have when taking part in their newspaper reading ritual. With regard to the language barrier that customers will most definitely encounter when speaking with a Honduran representative, (the primary language of Honduras is Spanish), I have faith that the slight nuances that we employ when “Stop Saving” or upgrading a customer will surely be lost in the new transactions. If we let the customers have one moment, to think about what we want before guiding their thoughts and hand to their credit card or checkbook we lose their subscription. In addition, some of our customers are very hard of hearing and can barely understand what we are saying as it is; with a strong accent I am sure that the clarity of conversation will not be achieved. I am thankful that I can provide service to people who may not be able to hear quite as well as some of us and that I can be completely clear about what our product is and what we can offer to our customers; I have a hard time believing that this same service will be ensured by someone who has no real connection to Colorado at all. I suppose that is why “Under management’s current outsourcing proposal, they estimate two full-time and three part-time union-covered positions would remain to handle email and escalated calls.” Poor souls…would it not be easier to keep those of us who are great under pressure and who can manage the problem at hand, on staff instead of having someone deal with angry customers all day and possibly causing some poor elderly person, whose greatest joy sometimes is reading the paper, give up because they can not seem to get the service they deserve. Maybe it is just me, but I would think integrity would answer that question quite simply with a, YES! In terms of integrity, the Denver Post should consider the long time employees who have sacrificed to keep the ship afloat. I have not been here too long, but in the short time I have been here I have heard many stories about how the Post has become like a home to many. There have been changes in format, in name and even in location, but all of that has not sent people packing it has only strenghthened the bond that people have with being a part of this company. All in all I just think it is unbelievable that there is no other way to save money and keep our jobs in Denver. I hope that at the next bargaining session all parties involved put forth true effort to save the Denver Post’s good name and are able to come back with proof that the really do “value and appreciate” all that we do for the Denver Post. Wow, what a SHAME. They would rather have someone from Honduras answer our calls. Do they now expect us to learn their language? Because, I sure in the heck know it’s not going to be easy for us to understand them. I HATE getting someone on the phone that I can not understand. Not only us understanding them, but them understanding us. We are going to have to be repeating ourselves over and over. Yes, I know, I have encountered this situation before. MANAGEMENT, don’t get to comfortable with your position. You may be replaced by a Honduran!!! TO WHOM IT MAY CONCERN: TO WHOM EVER IS IN CONTROL OF OURSOURCING THE INBOUND & OUTBOUND CALL CENTER OF THE DENVER POST TO HONDURAS.. ARE YOU KIDDING ME. IS THIS CALLED THE “AMERICAN WAY”? I’M CONFUSED.. TAKING JOBS AWAY FROM THE AMERICANS AND GIVING THE JOBS TO A 3RD WORLD COUNTRY. THIS IS OUT OF CONTROL. DO YOU REALLY THINK SOMEONE CARES ABOUT THE DENVER POST IN HONDURAS? LET’S BE REAL.. LET US KEEP OUR JOBS IN COLORADO. THIS IS TYPICAL CORPORATE GREED. THE RICH GET RICHER & THE POOR GET POORER. DOES ANYONE REALIZE THAT IT IS US LITTLE HOURLY PEOPLE THAT KEEP THIS COMPANY ALIVE. WE STRIVE EVERY DAY TO SAVE DENVER POST SUBSCRIBERS, AND THAT IS NOT AN EASY JOB. WE HAVE TOO MANY CHIEFS AND NOT ENOUGH INDIANS. HOW ABOUT SOME OF YOU 6 DIGIT PEOPLE; TAKE A CUT IN PAY; AND THAT WAY WE CAN KEEP OUR JOBS. GOOD THING WE DON’T OUTSOURCE OUT MILITARY BECAUSE WE WOULD NEVER HAVE A UNITED STATES OF AMERICA! Dean & his cronies are only concerned with Dean & his cronies at the expense of the “little people.” It’s the “little people” that made the paper what is “WAS.” Keep taking away the little people and you will eventually be left with NOTHING. Who wants to deal with “hard to understand Hondurans” who could care less about Denver? Way to instill that customer service Dean! I guess this is just the way of the world. When our country is struggling to keep unemployment levels down, our beloved Post is happy to add many more to that list and all with the hopes of lining their pockets with a few hundred thousand a year. Where are all the suits at? Still sitting in their offices I’m sure, going on vacations and eating lavish dinners. I’m sure any sort of pinch they feel in their wallet is one they have no problem ignoring, there’s always more where that came from. To send our customers off to a call center in another country, when I get comments because I simply don’t reside in BOULDER let alone Honduras…I wonder how that’s going to go. People aren’t dumb, but I guess that’s not what this company is worried about. They don’t care about employees who have made The Denver Post their lives, (not me, I’ve been here just about a year) they also don’t care about their subscribers who are quick to tell you they’ve been subscribing since the 60s. It’s all about money. What can we save? What can we cut? Well I hope that all the bigwigs who make those decisions can realize that it won’t be much longer before the entire company is under water in the wake of this decision. What then? Our customers are struggling with their pennies as well…and if they call in and get frustrated they will decide FORGET THIS!! They will begin saving those pennies…not willing to lend a single dime to a newspaper that is so out of touch with the basis it started on. So I’m sure that extra $400,000/year will become smaller and smaller. The Denver Post has been around since the very late 1800s. And yes, the economy has a lot to do with the decision. This is the Electronic Age, but you either sink or swim. I’m sure the forefathers of this company never dreamed in a million years that to save a buck they would send their customers to be “cared” for by another country. I think I’ll end my rant there. I hope our comments will add some consideration to the decision, but to be honest…sounds like the ball is already rolling. Wow, this is a perfect example of corporate greed that is ruining America’s economy. The rich continue to get richer, while the less fortunate who work to keep this economy going get nothing in return. Like many of you who have voiced your comments on this space, I have not been employed for the Post very long. However, in my 4 short years, I have come to realize that our hard work is not recognized by the big decision makers in this company. Our department has worked through the closing of the Rocky Mountain News, constant changes to delivery and content (that we did not have any input in) AND we are now taking calls for 3 additional papers WITHOUT any increase to our pay or benefits. Haven’t we sacrificed enough? You claim that outsourcing us will save the company $400,000. Are we worth so little to you? Have you actually considered taking a cut to your own pay to save the company as a whole? Or would your prefer to lay off your front line and risk the entire company going under? Even considering outsourcing our department to another country has made clear to me that you value your pocketbooks more than your workers. Thanks for working for me as hard as we have worked for you. I agree with all of the comments above, and it is truely a sad commentary on America when the business “leadership” is leading us down a path that will result in America becoming a third world country. Greed is the only emotion that our leadership at the Denver Post seems to have. Well said Barb. They say greed is the root to all that is evil and the ultimate path to distraction. Our management likes to tout that like it or not the companies that are being used to outsource work have improved over the years. But I assert for every company that claims they are satisfied with the service in the Philippines, India and Honduras etc. there are just as many companies that are bringing the work back to the US because of consumer dissatisfaction. Here are just a couple questions to consider. The Customer Service and Retention Department are the face of the Denver Post. We not only the liaison for our circulation customers but we also are contacts for advertisers, the newsroom, HR, and deal with inquiries about general questions and information. At this time customer service is integral in the of success of any organization. With word of mouth and social media one bad experience is quickly reported to thousands of customers and potential customers. Do you really want someone in Honduras being that representative? Our departments are like Colorado weather. They change from hour to hour. We constantly deal with problems with our systems, changes with rates, promotions, content of the newspaper and financial/billing issues. We are always in flux and have to be able to embrace these changes and adapt quickly. Do you believe that a clerk thousands of miles away, with English as a second language, in a different environment, can grasp and comprehend? With the economy and unemployment issues, in our country, consumers are becoming less accepting of companies that outsource. We know that there are many options out there to get your news and advertise. Do you really want to risk this backlash? Our employees are interested in nurturing a good relationships/reputation among Denver Post customers. These are our fellow Coloradans, neighbors, advertisers we frequent, and news that affects our lives. Do you want people who don’t identify, on any level, with our organization or Colorado communicating with your customers? We all understand our industry is struggling. But is s $400,000 in savings (which is questionable), worth risking the relationships fostered with consumers, the integrity, identity and reputation that the Denver Post has forged in Colorado over the years? Shame on you, Denver Post…for your greed, your lack of justice, compassion, integrity…and for your lack of standing behind your own employees and their lives. When I worked for the News, I saw lots of waste throughout the company. Surely you can find ways to save money, including reducing some salaries of the lazies who make big money and go out golfing during workdays. Why not save lots more money and outsource other departments too …. how about classified? Human Resources? Editorial? Printing? You know that some of these jobs could be done by just anyone, right?!?! Lets let the Honduras do the whole paper, since you all don’t seem to support USA and keeping jobs here. As a subscriber to the paper, I HATE the thought of dealing with foreigners when I have a complaint, an inquiry or want to pay my bill. I HATE talking to people that I can’t understand…I want to talk to an American. Customer Service in this country has gone downhill. Outsource, and you will lose customers and advertisers. I can read the news elsewhere. Do the right and honorable thing … let your employees handle the calls…professionally!!! Denver Post – We are Honduras! I for one am extremely saddened and repulsed by the Denver Post management to propose to outsource the Customer Service Dept. to a foreign country like Honduras. At a time when America is struggling hard to recover from one of the most devastating recessions in recent memory. This recession was brought on by the same corporate greed you are proposing, trying to get something for nothing. When the middle class is gone, who will be left to but your product? I think you know the answer to that, and where your company is going. This kind of shortsighted management decision will certainly damage your company beyond reparation. Where is our sense of moral obligation to put this fine country back on the path to prosperity. 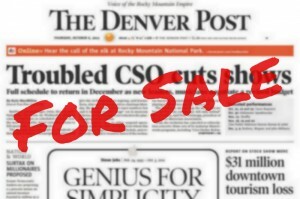 Have we been blinded by our thirst for easy money, that we cannot see that duplicating these foolish decisions will only accelerate the inevitable demise of this fine historical company, The Denver Post. Please consider the consequences of this irrational proposal, and how this will affect the lives of all the loyal, hard working employees working for you, including my wife who has given twenty six years of hard work and dedication. Be smart and do not disappoint. They took Finance off the table because they laid off all of circulation accounting (3 people), one collector, and our AP Clerk. They keep making up vice presidents but with no one under them, how else are they going to pay for their toys!